Programs and Partnerships Officer, Scott Baker said that the displays will be up all week but most of the fun will happen on Threatened Species Day. “We are working with the NSW National Parks and Wildlife Service and the Office of Environmental Heritage’s Save Our Species program so we have several hands-on activities planned,” he said. “There are activities suitable for all age groups during the day, just drop in any time between 10am and 3pm. “Children will love the giant snakes and ladders game and will learn what it’s like to be a tiny beach bird just hatched out on a beach. A special ‘book nook’ will have shorebird picture books for children to enjoy including the newly published ‘The Birds, The Sea and Me’ which is set on the South Coast and features hooded plovers, sooty oystercatchers and little terns. An exhibition will display stunning photographs of shorebirds taken by locals on the Far South Coast and there will be a brief shorebird video available for viewing. 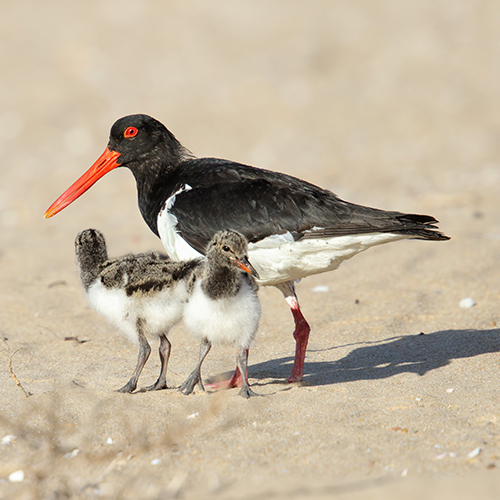 Photograph: Pied Oystercatchers on Tura Beach by Leo Berzins.